Michael and Dafna are devastated when army officials show up at their home to announce the death of their son Jonathan. Michael becomes increasingly frustrated by overzealous mourning relatives and well-meaning army bureaucrats. While his sedated wife rests, Michael spirals into a whirlwind of anger only to experience one of life's unfathomable twists which rival the surreal military experiences of his son. 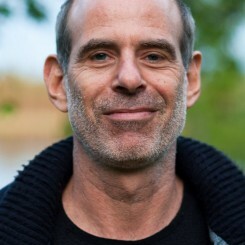 Samuel Maoz was born in Tel Aviv in 1962. At 13, he received a 8mm movie camera and a roll of film. By 18, he had already made dozens of films. As a young soldier he was part of a tank crew. Only when war broke out in June 1982, did he learn the horrors of being a gunner. In 1987 he completed his cinema studies, but it took him 20 years more to finally create his first feature film, Lebanon. It recieves Golden Lion Award. 8 years later he wrote and directed his second film, Foxtrot. 2000 Total Eclipse – doc.